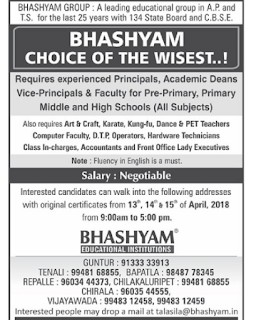 Bhashyam Educational Institution, AndAra Pradesh has advertised in THE EENADU newspaper for recruitment of Teaching/Non Teaching Faculty jobs vacancies. Interested and eligible job aspirants are requested to walk-in within 13th,14th,15th of April 2018. Check out further more details below. 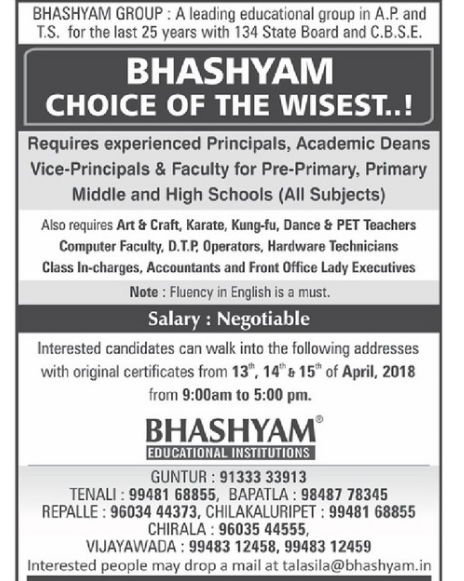 Name of the School: Bhashyam Group, Andhra Pradesh. About School: Bhashyam Educational Group has been tremendously successful in the field of education, because it has not waited for things to happen, but has created opportunities instead of waiting for it to knock.This proactive approach has resulted in creating many vistas for learning and setting up different verticals in the field of education to suit the varying needs of the students. In over two decades of its existence, it has delivered to the society a steady and healthy band of successful youngsters who have made a mark in their respective career charts. Bhashyam has grown tall and spread far and wide at a decent pace mainly because parents and students responded. Ring Road, GUNTUR, A.P., India.